Commonly, malware will fingerprint the host it executes on, in an attempt to discover more about its environment and act accordingly. Part of this process is quite often dedicated to analyzing specific data in order to figure out if the malware is running inside a VM, which could just be a honeypot or an analysis environment, and also for detecting the presence of other software. For example, malware will quite often try to find out if a system monitoring tool is running (procmon, sysmon, etc.) and which AV software is installed. In this article, we will introduce another method of fingerprinting a host that could be potentially abused by malware. In this section we provide a short list of well-known ways of detecting a VM environment, and the presence of other security software, that are often applied by malware. Note that the following list is not exhaustive. If you have some experience with Windows kernel drivers development & analysis, you should be familiar with the ExAllocatePoolWithTag  function that is used in order to allocate memory chunks at kernel level. The key part here is the ‘Tag’ parameter that is used in order to provide some sort of identification for a specific allocation. If something goes wrong, for example because of a memory corruption issue, we can use the specified Tag (up to four characters) in order to associate a buffer with a code path in the kernel driver that allocated that memory chunk. This method is adequate for detecting the presence of kernel drivers, and thus software that loads modules in the kernel that could potentially circumvent the fingerprinting methods mentioned above, which rely on information that a driver could potentially alter. In other words, it is ideal for detecting the stuff that really matters from the malware author’s point of view. For example, security/monitoring software might try to hide its processes and files by registering callback filters at kernel level. An analyst might try to harden their VM environment by removing artefacts from the registry and other things that malware is usually searching for. However, what a security software vendor and/or analyst probably won’t do, is modify specific kernel drivers used by their own program and/or system/VM environment to constantly alter the Tags of their kernel pool allocations. This information can be obtained by calling the NtQuerySystemInformation  function and selecting SystemPoolTagInformation (0x16)  for the SysteminformationClass parameter. The aforementioned function and the associated SysteminformationClass possible values are partially documented on MSDN, but fortunately with some online research we can find some documentation done by researchers. In particular, Alex Ionescu has documented a lot of otherwise undocumented stuff about Windows internals in his NDK  project. 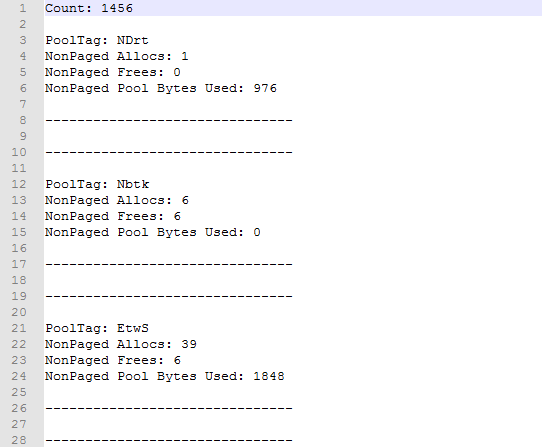 For this proof of concept, we wrote our own version of getting and parsing PoolTag information, but if you want to go the GUI way to experiment with the results, then PoolMonEx  is a really nice tool to play with. For instance, the following is a screenshot of our tool’s output. Source code below. Which you can compare with regards to the Nbtk tagged allocations results from PoolMonEx as shown below. In order to give some sense to the acquired PoolTag information, it is necessary to analyse those drivers that we are interested in. By searching for calls to ExAllocatePoolWithTag we can log specific tags used by those drivers and keep them in our list. At this point, you should be aware that any driver can use any tag at will, and for that reason it makes sense to try to find some tags that appear to be less common and not otherwise used by standard Windows kernel drivers and/or objects. With that being said, this method of detecting specific drivers might produce false positives if not used with extra care. For the sake of demonstrating a proof of concept we have collected some PoolTag information from specific drivers. Just like every other method, this one has its strengths and weaknesses. This method cannot be easily circumvented, especially in 64-bit Windows where the Kernel Patch Protection (Patch Guard) does not allow us to modify kernel functions among other things, and thus directly hooking those such as NtQuerySystemInformation is not a solution anymore for security and monitoring tools. Also, this method is not affected by drivers that attempt to hide/block access to specific processes, files, and registry keys, from userland processes. In addition, this method could be potentially used to fingerprint the host further. By searching for specific tags of Windows objects that are being introduced in the OS, we can determine its major version. We later did a quick verification by using two VMs, and we could indeed find pool allocations with at least two of the aforementioned tags in Windows 10, while there were none of those in our Windows 8.1 VM. That being said, it is a common and good practice for kernel driver development to use tags that make some sense based on the module that allocates them and their purpose. On the other hand, as mentioned already, PoolTags can be used at will and for that reason we have to be careful about which ones we are targeting. One last thing to mention is that PoolTag information changes all the time, in other words chunks of memory are constantly allocated and de-allocated, and for this reason we should keep this in mind when choosing the PoolTag to search for. Even though this method might look more experimental than practical, in reality when malware is searching for specific monitoring and security software, PoolTag information can be very reliable.